October 23, 2012 (Vancouver) — Seventy eight percent of British Columbians say that it’s important or very important for political leaders in BC to address poverty, according to a recent poll conducted on behalf of the BC Alliance for Healthy Living. ‘A provincial poverty reduction plan with clear targets and timelines to reduce the number of British Columbians living below the poverty line’ was the most popular response. British Columbians were asked to consider a number of disease prevention measures that leaders should act on now. “The poll shows that the public understands the relationship between poverty and health, and more importantly, they expect government to act on the facts,” said Scott McDonald, BCAHL Chair and CEO of the BC Lung Association. Support for a poverty reduction plan was even higher among seniors (82%), women (84%) and those with household incomes below $50,000 (86%). They also placed a high importance (80%) on increasing income assistance rates to account for the real cost of a nutritious diet and market rental rates. “Even the most basic nutritious diet, can eat up 35% – 47% of the monthly budget for those on income assistance,” said BCAHL Member and Dietitians of Canada, BC Region, Regional Executive Director, Kristen Yarker. 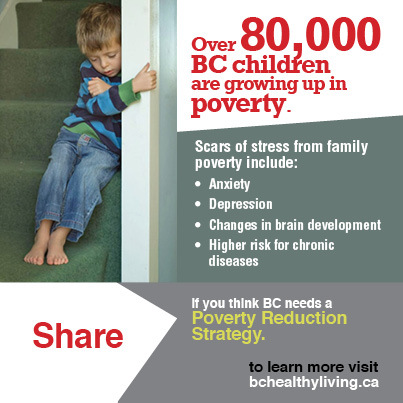 “It’s encouraging to see this level of support for a provincial poverty strategy, as it’s something we know can improve health outcomes for vulnerable British Columbians.” British Columbia is one of only two provinces without a provincial poverty reduction plan. High levels of support were also given to measures that would improve healthy living conditions – such as access to nutritious foods, affordable housing and healthy workplaces. “We’re also pleased with the high levels of support for workplace wellness programs. This is an area where BCAHL looks forward to working with its members, the private sector and the provincial government to encourage employers to invest in the physical and mental wellness of their workforce” commented Mary Collins, Director of BCAHL Secretariat. The poll was conducted by Vision Critical in the second week of October and is accurate +/- 3.5%, 19 times out of 20. The results have been statistically weighted according to the most current education, age, gender and region Census data to ensure a sample representative of the entire adult population of British Columbia.